James Henry Getze makes his debut – right on schedule! 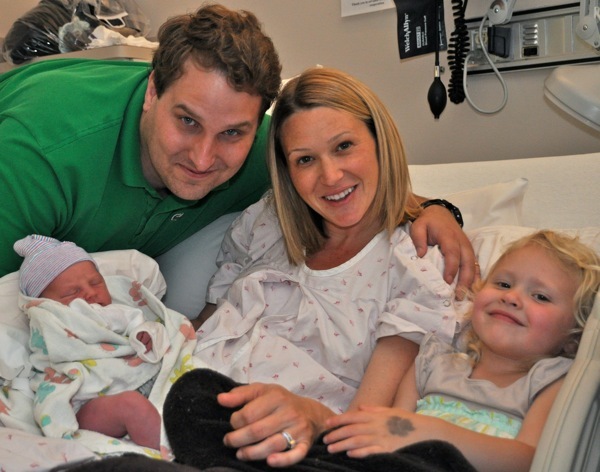 Giants first baseman Audrey Huff promised his wife, who was born on June 2, a break out game. So he hit three home runs today against St. Louis. The Dawn Jogger kept promising her good friends Terye (they were in Miss Sutow’s second grade at Hillview!) and David that grandson James Henry would be born on their birthdays. She really didn’t think it could happen – but it did. But before she met her little brother – and housemate to stay! – she and the DJ spent a few hours at the Oakland Zoo (that’s why she has paw print on her hand) where, somewhat ironically, she became a “big girl.” That milestone was signified by the fact that she learned how to pull the stick in her airplane ride back enough that the plane “flew,” rather than circle around at ground level. 5 Responses to James Henry Getze makes his debut – right on schedule! Beautiful picture! Congratulations, Grandma x 2. And as for Grace, well, I’m sure she will have the necessary grace to make the transition. What a beautiful photo! Of all of them, and Grace is holding so much joy! Love how you were together at the Oakland Zoo, such a fun place.